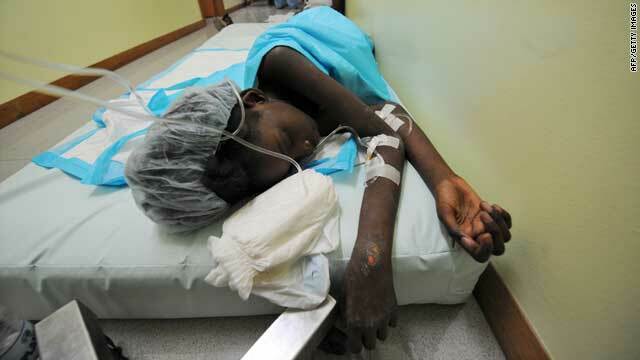 Mendji Bahina Sanon, 11, sleeps at a hospital in Port-au-Prince on Tuesday. She survived more than a week under the rubble of her collapsed house. Emergency physician: "You can go 10, 12, 13 days without really having a problem"
(CNN) -- The fact that survivors have been unearthed more than a week after being entombed without food or water in quake-stricken Haiti is no surprise and simply underscores the body's resilience in the face of adversity, emergency medicine experts told CNN Wednesday. "You can go 10, 12, 13 days without really having a problem," said Dr. Eric Weinstein, an emergency physician in Summerville, South Carolina, who is on the Disaster Preparedness and Response Committee of the American College of Emergency Physicians. "Particularly if you're healthy to begin with." Weinstein's comments came hours after a 5-year-old boy, Monley, was pulled alive from rubble nearly eight days after the 7.0-magnitude quake had leveled much of Port-au-Prince, Haiti's capital. More than 121 people have been pulled alive from the rubble, the United Nations said Wednesday. Monley was taken to a hospital to be treated for severe dehydration and doctors attributed his survival to resilience and the strength of his young body. "They'll have some electrolyte abnormalities; they might have some organ dysfunction like their kidneys might be starting to slow down, their liver, their bowels might have some issues, but with rehydration ... they should have good recovery," Weinstein said. Doctors have learned from experience with concentration camp survivors and prisoners of war that rehydration after a long period without food or water should be done slowly, he said. "If you rapidly rehydrate them, the body gets overwhelmed and you actually do more harm," he told CNN in a telephone interview. Deprived of food and water, the body initially breaks down glycogen stored in the liver into glucose to fuel its most critical functions -- the heart and the brain, Weinstein said. But those stores can be depleted within hours, after which the body begins to cannibalize itself -- burning fat and muscle to power its critical functions. That process creates acetone and ketones, which can make the blood more acidic. That can give off the smell of acetone, which can be confused with alcohol. The process also causes the heart to beat irregularly, he said. That's not the only danger. Muscle cells break down into myoglobin, which can cause kidney failure, he said. And there's more. Lying motionless for just a few hours can cause the blood to pool and clot, raising the risk of stroke or pulmonary embolism. The opposite problem -- uncontrolled bleeding -- is also a risk when the body consumes its platelets, which control clotting, Weinstein said. "Then, you just freely bleed. That could be a problem." Despite Wednesday's rescue, the window is closing, he said. "At 10 days, you really start getting nervous." A 2004 research published in Prehospital and Disaster Medicine, examined news and medical reports of rescues after earthquakes that occurred between 1985--2004. The review found that a total of five live rescues were reported at least 10 days after the impact, and that a few rescues occurred as late as two weeks after the disaster. Earthquakes in September 1985 trapped 22 newborns in two Mexican hospitals. They somehow survived nine days in the rubble, according to news reports. Some survivors had access to the basics. After a 2003 earthquake in Algeria, a 13-year-old female who survived four days was reported to have been trapped with the pancakes that she sold for a living. A 97-year-old female who survived nine days in Iran had access to food that had been next to her before the 2003 earthquake occurred. A man rescued from a Philippines hotel gym two weeks after the 1990 earthquake had daily access to rain water. Some media reports from previous earthquakes described entrapped patients drinking their own urine. Researchers concluded that victims could survive on average for five to six days entrapped, but under favorable circumstances, can survive up to two weeks. Working against those still trapped is the fact that no rain has fallen since the January 12 magnitude-7.0 quake struck off Port-au-Prince. "You don't need to eat for a week or two as long as you have water," said Dr. Michael Gerardi, a pediatric emergency specialist in Morristown, New Jersey, who is on the board of directors at the ACEP. But people who were well hydrated at the time of the earthquake could still be alive, he said. "It's conceivable, and not unheard of, for people to live seven to 10 days with no water or food -- if they have not been exposed to the elements," he said, referring to the Caribbean island's warm, tropical weather as a plus. Survival may come at a price. Gerardi said those being pulled to safety may suffer organ dysfunction. "The kidneys probably took a hit," he said. And profound dehydration could cause brain damage, he said. "If you had low blood pressure -- barely perfusing your brain -- then you're going to take a hit to your brain." Predicting a limit to anyone's endurance is impossible, since many factors affect survival, said Dr. Deborah Ann Mulligan, professor of pediatrics at Nova Southeastern University in Fort Lauderdale-Davie, Florida. For example, a child left in a hot car or an athlete exercising hard in hot weather can dehydrate, overheat and die in a few hours, she said in an e-mail. "Ill health, exposure to the elements, shock and panic can reduce your survival time in any situation," she said. "An adult in comfortable surroundings, in contrast, can survive for a week or more with no, or very limited, water intake."